Plantronics Calisto P240-M handset. 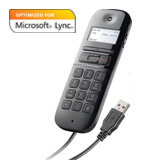 Make the evolution to PC communications simple with the new Calisto 240 USB handset. It’s perfect if you’re new to PC calling. With its portable size, LCD display and integrated personal speakerphone, managing PC calls on-the-go has never been easier. And with top of the line audio technology, you’ll like how you sound, too.